Plants require different acidic levels--which are measured in pH--to help them absorb the valuable nutrients in the soil. If your soil’s pH is less than 6.5, it is considered acidic. If it is more than 7.0, it is considered alkaline (low in acid). Fortunately, most plants need a soil pH level between 6.0 and 6.8. 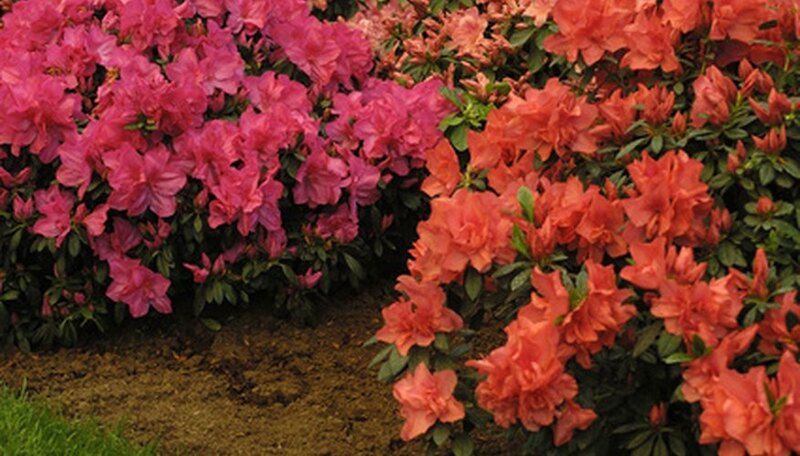 However, if your soil is alkaline, you may need to lower the pH (raise the acid level) in order to improve the soil, especially for plants such as rhododendrons, hydrangeas azaleas and blueberries, which grow best in acidic soils. Test your soil’s pH level. Take a sample of your soil (composed of soil from three or four different spots in your garden) to your local county extension office or purchase a testing kit at your local garden store and test it yourself. Follow the label instructions, but typically gather soil from three or four spots from your garden and die it with the provided die. Compare the color of the soil after about three minutes to a color chart to find out the pH level of your soil and use one of the following methods to lower your soil’s pH level. Add a liquid soil acidifier, such as Miracid, for quick results. This works well for gardens that are already planted. Follow label directions, but usually you mix 1 tbsp. to a gallon of water and water an area of approximately 10 square feet. Reapply this every 2 weeks to remain effective. Mix in iron sulfate to the top 6 inches about a month prior to planting. Use about 4.8 pounds (e.g., for sandy soils) to 19.2 pounds (e.g., for loamy soils) of iron sulfate per 100 square feet to lower the pH by one point. Again, follow label instructions for proper application and dosing amounts for your type of soil and current pH levels. Incorporate elemental sulfur a year prior to planting to the top 6 inches of your soil. Use between 0.8 to 2.4 pounds (how much depends on your soil type) for every 100 square feet to lower the pH by one point. Read the label carefully for correct dosing and application methods. Mix in organic compounds that reduce pH levels, such as compost, manure or sphagnum moss, about a year prior to planting. To lower the pH by one point, incorporate the matter into the top 6 inches of soil at a rate of 14 pounds of compost, 5 pounds of manure, or 2.5 pounds of sphagnum peat moss for every square yard.